They are full brother and sister. In the photo gallery you will be able to see pictures of their dam and sire. We pride ourselves in providing quality training for both horse and owner. We want our clients to be present as much as possible during training sessions to learn the method and see first hand the progress. Once we have the horse within 2-3 weeks of completing their training, we have the client begin working with the horse, critique them and assist them with improving their abilities to correctly work their horse. We travel to you and your horse; if there are onsite facilities to work the horse. If no onsite facilities, we suggest you send your horse to us. Everything within 30 miles is free estimates/assements and no mileage is charged to travel to you for training. Over 30 miles, mileage is charged for estimates/assements and for travel to train your horse; therefore, we suggest if you are over 30 miles away to send your horse to us for training to help keep the cost down. Must have a useable roundpen for us to work onsite. *The mileage fee is not included with our hourly rate, but added to for those over 30 miles away. My name is Keli Graham, I am a 40 year old mother of two girls. Both are grown with families of their own and I can now resume my career and dream of training horse and help others to get as much enjoyment out of their horses as I do. 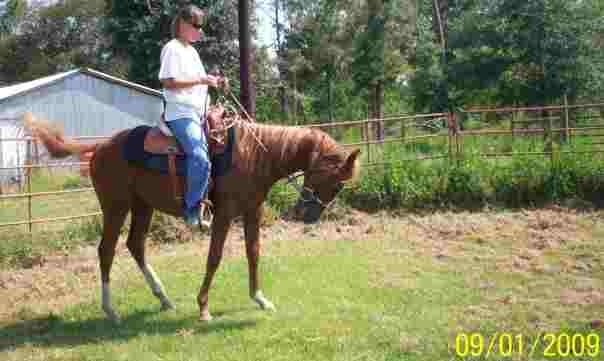 I live in Orangefield, TX and have been riding since I was two and started training when I was in high school. I put my horses on hold to raise my kids, with that done; it's time for me to have a little fun. I am currently working on my Equine Science degree, specializing in breeding and training. My long term goals are to finish my degree, complete Clinton Anderson's Advance 10 day clinic, and attend his certification program to become a certified clinician for him. I have several apprentices that work with me. They are really good and I am always onsite with them to watch and coach them. They have a great love for horses as I do and they want to learn as much as possible to one day train on thier own. Call or email us today add your comments after we help you! Looking forward to helping out anyway we can. We don't just train the horse, we teach the client how to work with their horse. Copyright 2010 KG Horse Training. All rights reserved.